A new school-year is fast approaching! 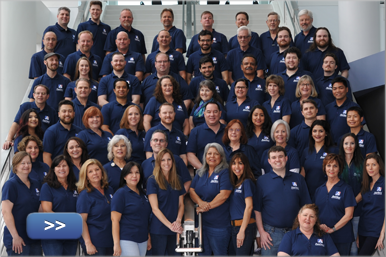 Like many of the administrators we work closest to, the summer was actually quite busy for us at Aeries Software. While a new user interface and other enhancements in version 8 of the web version of Aeries® SIS represent a significant improvement of the product by looks and features alone, we know that these elements are not the only pieces that go into ensuring a great user experience for everyone. We’re excited to share some procedural improvements we’ve been developing with regards to customer support that will mean faster, more accurate help for all users. First, we’ll outline changes we’re implementing to make more efficient use of our support reps’ and your time, effective July 31st. Now, when you call Aeries support via telephone, your calls will continue to be answered by a live person – except it will now always be a call coordinator answering to gather details and create a ticket on your behalf within Freshdesk. Additionally, we will add the ability to press a number key on your dial pad if you would prefer to leave a voicemail on a machine that will be turned into a ticket for you. Finally, you will be asked your preferred method of response back – via phone, email, or direct Freshdesk ticket response. Our support representatives will then research your matter and respond to you after having gathered potential solutions. With this substantial transformation in our procedures, tickets created directly through Freshdesk or via email are considered just as urgent as phone calls. Consequently, we encourage our customers to utilize Freshdesk to create tickets as a primary means of support. This method allows you to add in more details and context via written text and screenshots – which allows us to gain a better understanding of the situation and respond in a more timely, comprehensive fashion. We will continue to exercise our best judgment in determining when an issue needs to be escalated and prioritized for response. With the large majority of our support department consisting of former school district employees, we know all too well that emergencies do occur that require faster responses than others. Overall, this new method will improve our speed and accuracy of responses – respecting your time and providing you accurate solutions even faster. While we are particularly proud of the improvements we have made to our SIS over the summer, it is not the only endeavor Aeries Software undertook. We know that a great end-user experience also means access to helpful support resources and personnel, especially with a system as vast and multifaceted as a Student Information System. Taking into consideration our support resources available to our end-users, we quickly made the determination that it would be of great benefit to consolidate everything into a single area – including documentation, videos, known issues, frequently asked questions (FAQs), field mapping, and more. The benefits of a single location for all support resources is self-explanatory, but one notable little-known advantage is the fact that all knowledgebase articles are fully indexed and searchable. In other words, when you go to search for your particular issue, if there is an existing resource available, you will see it listed in your search results – whether it be from documentation, known issue articles, videos, FAQs, or community forum posts. 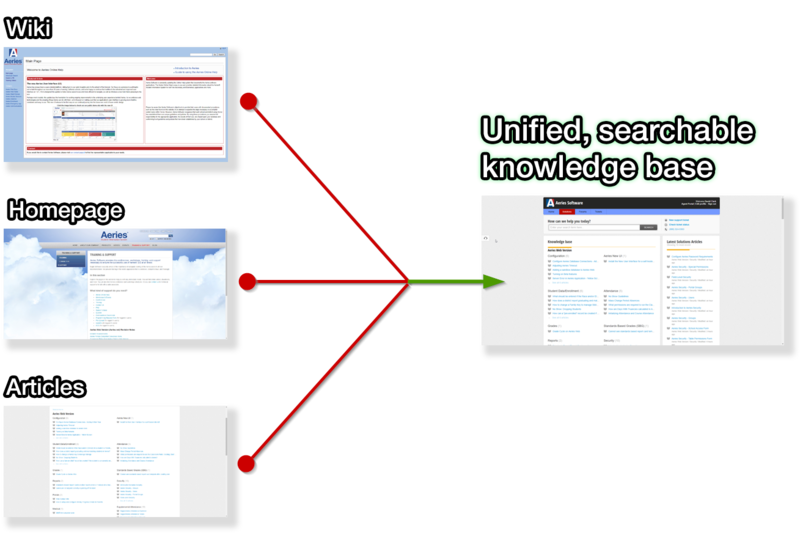 All Aeries knowledge and resources, accessible from a single search field. And if there is not an existing knowledge base article available to solve your issue, you can quickly open a ticket in Freshdesk from the same portal. As more documentation and other helpful resources are transitioned to exist solely within the Freshdesk knowledge base, the help icon within Aeries SIS will be updated correspondingly. 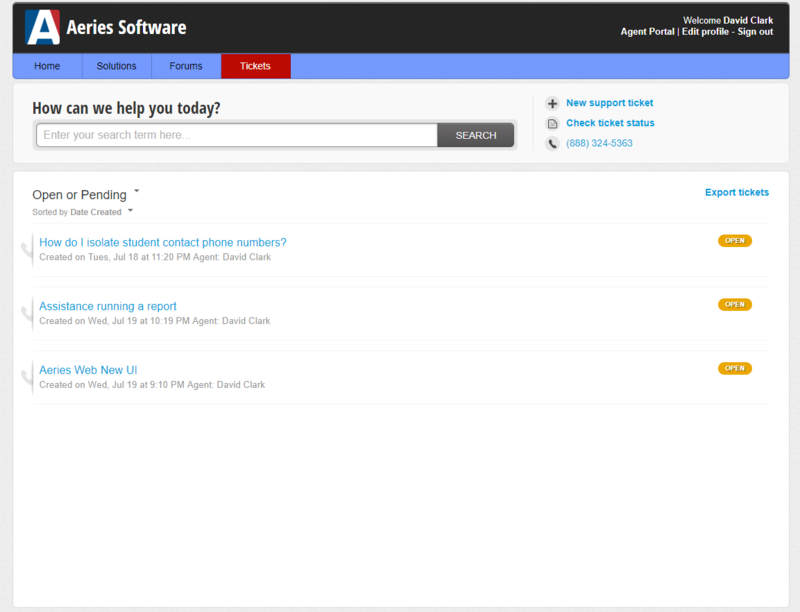 At some point soon, there will be a significant upgrade made to have the knowledge base directly accessible within Aeries SIS in its own panel on the right-side of the system once you click the help icon – further streamlining the ability to obtain help right when you need it. While we feel that the knowledge base will allow users to help themselves in a quick and efficient manner, we didn’t stop there. In reflecting upon the support department itself, we looked at our two most important objectives: both the speed and accuracy of responses. To that end, we identified some procedural improvement areas that would provide a boost to efficiency, and complement our commitment to offering exceptional service to our customers. One challenge we faced was that given the enormity and multi-faceted nature of Aeries SIS, we found that not all calls could be answered immediately without doing some research to come up with the appropriate solution, which sometimes translated to more time spent for both our support reps looking into open issues, and our clients waiting on hold for a solution. Meanwhile, tickets created directly through Freshdesk or by email were sometimes regarded with less urgency than live calls, despite the fact that they often contained more of the details necessary for our team to resolve the problem sooner (which wasn’t always the case with the typical support calls). These challenges were a major motivation behind the changes to our customer support procedures. With all that said, we want to circle back around to outline a picture of how your interactions with our customer support resources and personnel will change. Whether you’re an administrator, SIS manager, or a CTO, we have a few recommendations for you to help you get the most out of the new and improved all-in-one knowledge base and ticketing system. The best place to start when you need assistance is our self-service portal, where all Aeries documentation and known issues will be published and searchable. Run a search with keywords relating to your issue to pull up relevant results as you type. In the event that no resources are available to address your issue, we recommend you escalate to the creation of a new support ticket. Remember to include a descriptive outline of the problem, any steps you took leading up the issue, and upload any screenshots you might have taken. As we outlined earlier in this article, our team now considers support tickets as urgent as phone calls, and many issues that include a descriptive outline/screenshots can be addressed in a matter of minutes. These are all changes we’ve implemented as a part of a larger commitment to better serve the educators and students of California. We will continue our commitment to improving both our product and internal procedures, and measuring the impact and effectiveness of those changes. As always, if you have any questions or thoughts for us on what we outlined in this article, don’t hesitate to reach out - we want to hear from you!